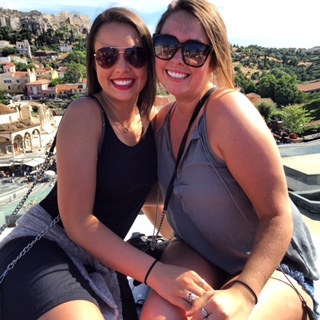 Olivia Cesarone, a junior at the University of Alabama, shares her thoughts on the beginning of LEAD Greece! If I were to describe my first night in Glyfada, Greece, I would use the word spontaneous. Upon arriving at the Congo Place Hotel I wanted nothing more than a shower, but we met as a group for a quick orientation. Along with being the first night for everyone it was also my birthday the following day. I was so nervous to ask who was going out or if anyone had plans. I reminded myself that everyone was in the same boat and just went for it! A small group of us left the hotel around 10pm to find a place to eat… yes they really eat that late here. We ended up walking a block and found the cutest place called Gazi College. The menu had everything from asian to pizza and everything in between. We all ordered after struggling a little with the language barrier. I really want to try an learn some basic greek, I think that simple conversation words will really help enhance my time here. After dinner was over we moved to the bar where we joined several other people from our group. I could have not asked for a better night! I found a great restaurant, met lots of new people, and had a great birthday. My hope for the rest of the trip is to fully dive in. I want to return home knowing I did not miss out on a single thing!